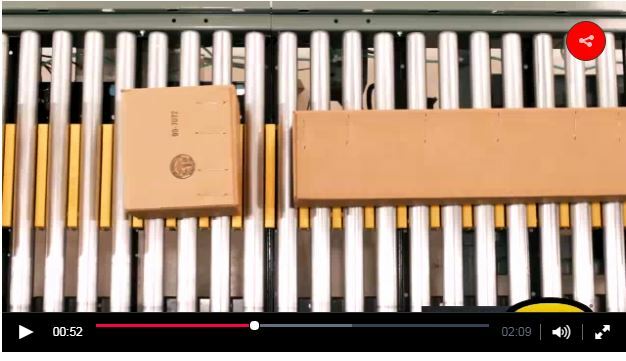 These conveyors transport and create a “line” for conveyed items like cartons, individual items, pallets and other types of loads. This is ideal for conveyors that move products into a buffered process, such as from a picking line to a packing area. They hold the load in place automatically when combined EZLogic accumulation controls, so that the line doesn’t move until you’re ready. For instance, a carton that enters a packing area will hold until those in front of it have been packed and moved to the next slot in the queue. A pallet would hold in place while those in front of it are being built. Minimum pressure conveyors allow products to lightly touch, while zero pressure conveyors completely prevent loads from touching each other. Use minimum pressure for consistent loads (sizes, weights). It’s also more economical. You do not want larger cartons impacting smaller ones, or heavier cartons hitting lighter ones on the conveyor line. Zero pressure is ideal for a diversity of loads and buffering for entering certain types of equipment. It’s also better fragile loads. Accumulation conveyors can be built in fixed or dynamic zones. Fixed zones are the same length for every zone in a line. Dynamic zones can vary, but must be longer than the longest load that could be conveyed on the system. This is the difference in how loads are released by the conveyor system. Slug mode will release all of the conveyed loads simultaneously, while singulate mode does this one at a time. Both modes have their place, depending on your needs and application.